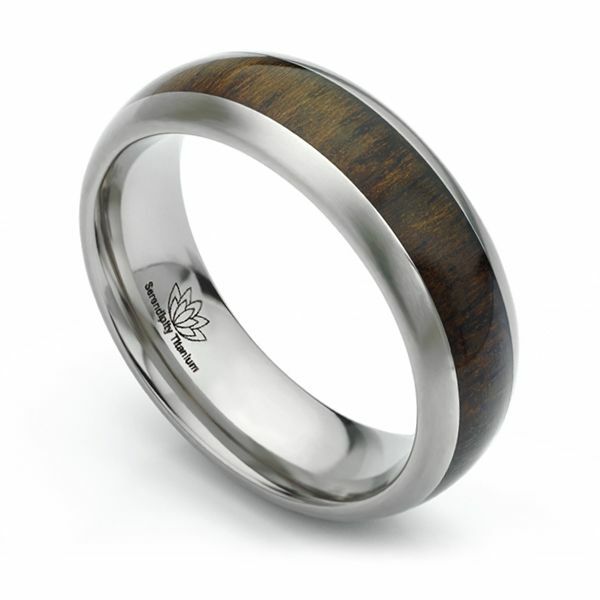 Beautifully crafted wood inlaid wedding ring, created with an inlaid section of Ziricote wood around a 7mm Titanium band. Enjoy the warmth and natural feel of this inlaid Titanium Wedding Ring. Crafted in a 7mm wide domed band, the ring features an inlaid 4mm wide strip of Ziricote wood. Precision engineered, your Wedding Ring will be created to order in industrial grade Titanium. Completed with a satin brushed surface, the wood inlay contrasts beautifully with its gloss finish. Your completed ring will be beautifully presented in pristine Serendipity packaging and hand-delivered to your door within a timescale of 3-4 weeks from the date of order. We deliver internationally to many countries and provide any additional advice and guidance wherever needed. We provide a free ring sizer and have a selection of loan ring size examples available to double check your size ahead of placing the final order. See the button below to check your correct finger size. Ziricote (Cordia dodecandra) is found from Florida south through the Caribbean islands to Brazil. Most of the harvesting occurs in Central America, specifically Mexico, Belize and Guatemala. It is a small, slow-growing tree, typically 30 to 60 feet high with diameters of up to 3 feet. It is a brown to grey hardwood with distinctive dark patterns making this a beautiful wood, perfect for an inlaid wedding ring.